How can you get those photo op wildflowers and native grasses right at home to bring wildlife right up close? Fall is the time to seed spring wildflowers, while late winter to early spring is best for native bunch grasses. Get tips for the home garden or meadow with Luke Turner from family owned and operated Turner Seed. On tour, a young family turned overgrazed land into majestic waves of wildflowers and grasses that greets the eyes and grateful wildlife. Daphne analyzes problems with a ‘Jane’ magnolia tree. Roll up a family fun dinner with Trisha Shirey and Casie Luong’s yummy spring rolls. Kasie and Andrew Brazell followed their dreams to 15 acres northeast of Georgetown to raise their young family. To restore the former cattle grazing ground on the Blackland Prairie, they dug out invasives and planted native wildflowers, perennials, and grasses. Despite Andrew’s long daily commute to his job in Austin, he returns home to acres of butterflies, bees, and other wildlife that connect their small children to a future filled with wonder. How can you get those photo op wildflowers and native grasses right at home to bring wildlife right up close? Fall is the time to seed spring wildflowers, while late winter to early spring is best for native bunch grasses. 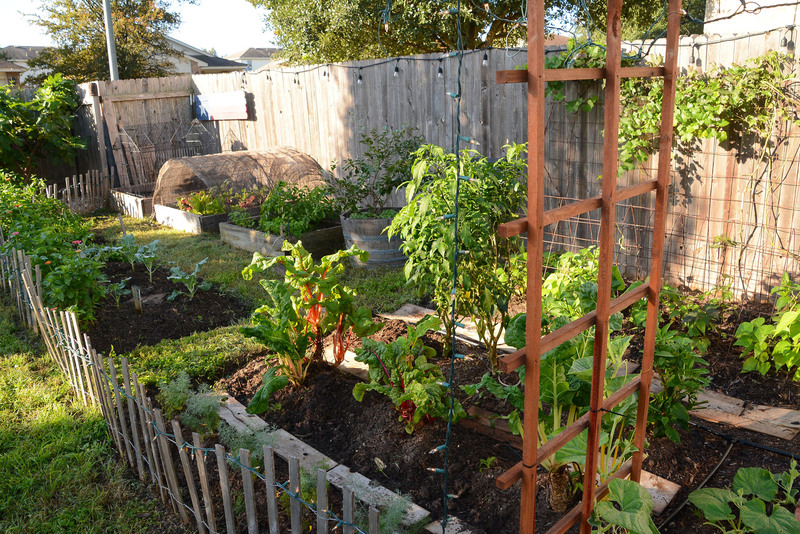 Get tips for the home garden or meadow with Luke Turner from family owned and operated Turner Seed. Host: Tom Spencer. What’s wrong with my magnolia tree? Thanks to Elizabeth Chinnault for sending this question about her two-year-old ‘Jane’ magnolia tree.She writes that the tree bloomed in early spring, and then she noticed the leaves starting to brown and look dry in mid-summer. She’s been spraying weekly with a fungicide, but the tree seems to be doing worse. Elizabeth also notes that the tree has been getting extra water during the hottest, driest times. Magnolias are commonly found in eastern regions of the US, and although they can be gorgeous and healthy outside of their normal growing environment, it is much more challenging to be successful with them when they are out of their element. Having the knowledge and experience that I have with plants, I was able to deduce from that information that this plant was going to struggle in Central Texas. And that it would be hard for it to be successful here, since none of our conditions are to its liking. That’s not to say that it can’t be done, just that the stars would have to align perfectly for this tree not to struggle here. Also, I’m not sure who diagnosed disease issues on the tree, but even if they were correct, spraying anything on the leaves of any plant when the temperatures are above 80 degrees and the air is dry is extremely stressful on plants. What I think would be best at the moment would be to keep watering the plant as necessary in the coming months, but ignore any other issues. It will drop its leaves soon for the winter, and when it blooms and then leafs back out in spring, watch for signs of stress. 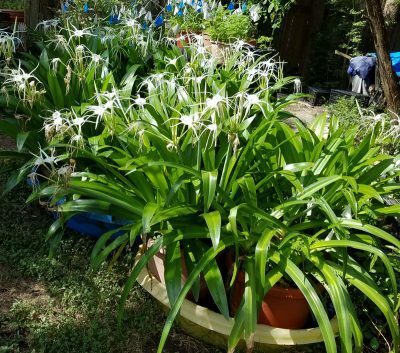 Our plant of the week comes from viewer Janis, who has some wonderful specimens of Hymenocallis, a perennial bulb and one of many species commonly known as spider lilies. Janis received these pass-alongs, which bloom in summer, from a friend in Rockport. She keeps them in kiddie pools, which helps greatly to conserve water. This is such a great technique that we wanted to share it with you. Janis drills extra holes about an inch from the bottom of each pot, all the way around so they can draw up the water they need, and also drills small holes just above the soil line, near the top of each pot, so that when it does rain, water does not collect at the top of the pots and rot the bulbs. The bottom of the pool is kept wet year-round, so it doesn’t dry out and crack. This is a great way to collect rainwater, and to keep the plants alive if you go on vacation. Casie Luong joins Trisha Shirey to make refreshing spring rolls with tips from her Vietnamese-born parents and Trisha’s fresh harvests. Get their recipe!